Haven’t enough trees been felled, enough ink spilled, enough careers devoted to praising, panning and parsing F. Scott Fitzgerald’s greatest creation? Surely the answer is yes. And yet Sarah Churchwell has done something almost unimaginable: She has discovered something new and she has written something fresh and revealing about the most chewed-over piece of fiction in the American canon. Churchwell’s new book is called Careless People: Murder, Mayhem, and the Invention of The Great Gatsby. As the subtitle implies, the book is not straight history; rather, it sets out to explore how fiction gets made, what sources novelists plumb, and how the events of an age shape the fiction that springs from it, and vice-versa. Churchwell tells the story of Gatsby’s creation in tandem with the story of a bizarre double murder that dominated American newspapers beginning in late 1922, lurid tabloid fodder that, in Churchwell’s view, seeped into the bloodstream of Gatsby. The victims of this unsolved double murder were Edward Hall, an upstanding Episcopal minister in New Brunswick, N.J., and Eleanor Mills, his married lover who sang in the church choir. They were both shot in the head and their bodies were discovered under a crab apple tree on a local lover’s lane, surrounded by their love letters. That remarkable moment was the year 1922, which began with the publication of James Joyce’s Ulysses and ended with the publication of T.S. Eliot’s The Waste Land. That fall, Fitzgerald, a newly minted literary star and media darling, moved with Zelda to Great Neck, N.Y. It was in that year and in that place that he would set Gatsby, turning Great Neck into West Egg, where the arriviste Jay Gatsby’s “huge incoherent failure of a house” faced across Manhasset Bay toward old-money East Egg, where Tom and Daisy Buchanan lived in carefree splendor, unaware that Daisy — and the green light at the end of their dock — were the magnets that would soon draw Gatsby to his doom. Considering what was in the air in the 18 months the Fitzgeralds lived in Great Neck, and in the ensuing months when he finished writing Gatsby in France, it’s not surprising that Careless People is a delightful blaze of a book. The air was full of music and laughter and parties, illicit booze and ill-gotten money and flashy cars, and characters from the worlds of show business, Wall Street, journalism, literature, and organized crime, all of whom seemed to share Fitzgerald’s mortal terror of “conventionality, dullness, sameness, predictability.” Such orgies tend to make good copy. Such boozathons were the rule, not the exception, during the Fitzgeralds’ time at Great Neck. Small wonder that he got little writing done there and yearned to get away. 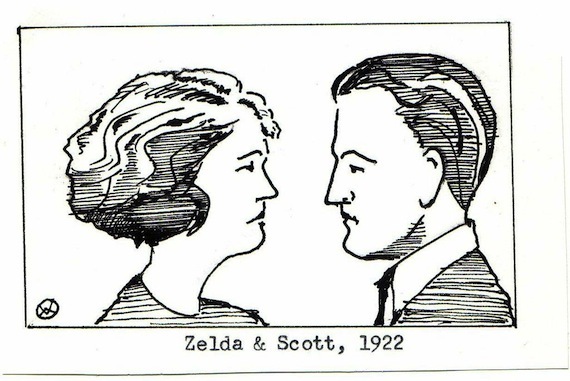 This passage also hints at the cracks in Scott and Zelda’s marriage, and it presages another of Churchwell’s sources, The Crack-Up, Fitzgerald’s autobiographical writings from the 1930s, collected and edited by Wilson. Sad as this is, it’s not as sad as re-reading The Great Gatsby and coming back into intimate contact with genius at its fragile peak, just before the crash. The greatness of the book points straight to the true sadness of Fitzgerald, something Churchwell addresses with an admirably cold eye: His failure to live up to his enormous talent. In a telling observation about Lardner, his friend and neighbor in Great Neck, Fitzgerald wrote, “Whatever Ring’s achievement was, it fell short of the achievement he was capable of, and this because of a cynical attitude toward his work.” This is most likely true, and I think it absolves Lardner, much as it absolved Nathanael West, another genius who had no capacity for evaluating the worth of his own work. That, it seems to me, is a far less grievous sin than the one Fitzgerald and a handful of other American writers have committed — Truman Capote and Jack Kerouac come immediately to mind — the sin of squandering an outlandish gift. Churchwell’s title is derived from the penultimate page of The Great Gatsby. Nick Carraway, the novel’s narrator, has just overseen Gatsby’s sparsely attended, rain-drenched, and thoroughly depressing funeral (an end that eerily foreshadows what awaits Fitzgerald). One day shortly after the funeral, as he’s getting ready to leave haunted New York and return home to the Midwest, Nick spots Tom Buchanan striding purposefully down Fifth Avenue. They stop to talk, and Nick’s suspicion is confirmed that it was Tom who directed the pistol-wielding cuckold George Wilson to Gatsby’s house, in the mistaken belief that it was Gatsby, not Daisy, who was the hit-and-run driver behind the wheel of the car that killed Wilson’s wife, Myrtle. Tom neglected to tell Wilson that it was he, not Gatsby, who was having an affair with Myrtle. The upper 10 percent has become the upper one percent and class resentment grows deeper and more bitter by the day, but otherwise not much has changed. The Great Gatsby will continue to inspire re-reading, re-thinking, and sad rejoicing. This is so because Fitzgerald was a genius who understood that we beat on, boats against the current, borne back ceaselessly into the past. I applaud The Millions for this smart essay on a day devoted to crass “anniversaries” of an altogether different sort. Kudos to Mr. Lundgren for bravely conveying the personal. Excellent piece Eric. It brought back for me memories not of the city (which I have unfortunately never visited) but of my seemingly never-ending dissertation on novels that attempted to apprehend the essence of protean 1980s capitalism. One of my chapters was on The 27th City, and to this day I think that it remains far more compelling than anything JF has produced since. To think that he was only in his late 20s and produced such a hugely ambitious work still astounds me. It well deserves the modern classic reprint. I remember the moment, the slow walk across the second grade classroom, to one of those bookshelves that could be pushed around on wheels. This one was parked, though, and I was heading for it. What was I thinking at the time? That, I can’t remember now, I can only recall the purposeful walk, as if something about that bookshelf called to me. And when I got there, I found a book that would change my life. Henry Huggins by Beverly Cleary. I don’t know why I picked it. I shouldn’t have. I was one of the worst readers in the class, and I can remember tearful sessions with my parents at home as I tried to make my way through the simplest of texts. This book was far more difficult than anything I’d ever attempted to read before. Perhaps it was the story, of Henry Huggins determined to take a stray dog home, the uncooperative bus driver indifferent to the delivery of Henry’s heart’s desire. At the time I had no dog myself. Did I want a dog, was that it? I can’t remember. Perhaps it was Henry’s quiet insistence in keeping this companion, his inventive persistence at achieving his goal. Maybe Henry’s example inspired me, helped me to teach myself how to use the dictionary so I could to make my way through this book filled with difficult words. Because I needed a companion too. Outside the closed door of my room, my parents’ inexhaustible battles played themselves out, arguments I could further muffle by entering the world of a book, though I couldn’t have put this into words back then, I’m sure. But I must have understood that I needed to learn how to read, in order to open the invisible door I sensed was there. Once I’d navigated Henry Huggins, other books easily followed, other companions: Tom Swift, the Hardy Boys, and then, as I grew older, a succession of adventure books set on fantastic worlds, packed with swords and gunplay. I wonder now, as I write this, was all that drama a way of domesticating the domestic warfare still waged by my mother and father, a way to ease the sting of conflict? Or was some form of escape the secret desire, the traveling to the distant worlds of Edgar Rice Burroughs, following John Carter to Mars, Carson Napier to Venus and David Innes to the center of the earth. Even now, I can’t believe that I can remember their names, or that Mars was called Barsoom. Whatever the desire, I read so much that eventually my parents forced me to go outside and play, and they talked to each other—and I overheard—of taking me to a child specialist to see if there was anything wrong with me. And still I devoured books, increasing the real estate inside me where I could find a place of my own, where my heroes always managed to slip away from disaster. But no book could prevent the disaster that occurred when I was eleven, when arguments seemed to serve no further purpose, when my mother tried to stab my father with a knife, when on another occasion she strangled him with a towel around his neck, his head stuck between two rungs of a banister. In both cases I worked my way between my struggling parents, and at this moment as I write I’m struck by a new thought, that perhaps all those years of reading adventure stories had given me a vocabulary of action, a means to save my father’s life, as if I’d been preparing, through books, for those charged moments without knowing it. Some poison had been leached by that violence, and in the months and years that followed my parents reverted back to the rituals of verbal sparring. What had set all this in motion, the steps to that terrible brink, and then the retreat? I couldn’t know. A change had occurred in me, too. My beloved adventure books had somehow lost their adventure. I would still read obsessively, but now dutifully, because the literary rituals of crisis and escape felt somehow empty—what I read no longer gave me what I wanted, though I didn’t yet know what I wanted. One day in seventh grade I ordered my usual stack of books from the Scholastic Books Service; one of them was an abridged version of Leo Tolstoy’s War and Peace. A little skeptical, I figured I could skip past the peace parts if they proved too boring. When the nine or so books I’d ordered finally arrived I saved Tolstoy’s novel for last—even abridged, the book was 500 pages long, longer than any book I’d ever read before. But its length was not the challenge, not in the way the vocabulary of Henry Huggins had been for me years ago. The challenge was of an entirely different order. I can remember the moment I realized I’d stumbled into new territory. I was sitting on a lawn chair in the backyard, beneath the clothesline, in the shadow of a tree. I set Tolstoy’s novel on my lap, then picked it up and checked the page number. Page 73. I can actually remember the page number. And what most struck me was that, after reading 73 pages, of a novel titled War and Peace, nobody had died yet, there was none of the action that I’d come to expect from all my previous reading. And most surprising, I didn’t care. Because I knew that this was already the best book I’d ever read. And nobody had died yet. Now how could that be? Here was action of a different sort: the action of the heart, the revelation of interior lives, the drama of inner conflict, all of which gave voice to my growing awareness of my own secret self. Here was a vast world that wasn’t Mars, or Venus, or the center of the earth. What had once been the pleasure of escape was now a pleasure of a different sort—that of a journey, a way to map inner landscapes. And a way, perhaps, to make sense of the tangled knots of my family, what we’d tied ourselves into. But never quite to make sense, never to completely unravel, because the books I read now offered no easy solutions, and that was the confounding joy of them, the messy truth no matter how elegant the prose or canny the structure. Such books gave me my future, not so much my future as a writer, though of course there is that, but my future as a human, a fallible human engaged in the futile attempt to know oneself and others. Each new book, like Zeno’s arrow, gets closer to but never hits the target. There is no easy or final understanding, but without the attempt, who can bear to live the isolation that is the alternative? And the more I read, the more I think that all readers have secret histories connected to the books they love, the books that have served for them as havens, or interventions. So every day, I open a book. Its words were once the thoughts of another human being, thoughts that could have remained private but are instead lined up in row after row on each page. An invitation to begin, to take the first steps into another mind, to step and step until there are no steps but instead the blessed drama of art’s illusion delivering the pith of human contradiction, the greatest gift of one mind offering itself to another, the foreign air we best breathe. The latter opinion has been fueled by the comments of a prominent Tokyo University professor Shozo Fujii, who argues that Lu Xun is one of Murakami’s primary influences. The 1 in the book’s title, he argues, should be read as the personal pronoun I. In other words, I am Q. What the 84 might stand for is unclear. Fujii’s analysis of Murakami’s work breaks with the commonly held view of Murakami’s influences, primarily Western writers and literary heavyweights like F. Scott Fitzgerald and Dostoyevsky (a view confirmed by Murakami himself). Nevertheless, Fujii’s theory about 1Q84‘s meaning has developed a large following online, and has been bolstered by his close readings of Chinese literary themes in Murakami’s early novels, Hear the Wind Sing and The Wind-Up Bird Chronicle. In some ways, yearbook camp felt like an extended Tony Robbins seminar. Each morning we met in the auditorium, where one of the staff led us in a group chant to get us fired-up for the day. I am from New Jersey, and only get fired-up for pizza and pork roll sandwiches.